Intended for both the professional and the amateur craftsperson, Arts & Crafts is an important source on the middle period of the Arts and Crafts movement in England. 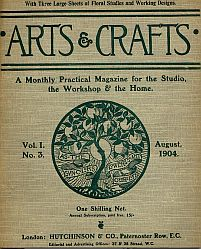 In addition to practical articles on craftmaking, particularly jewellery, bookbinding, furniture, metalwork and embroidery, it included articles on the work of some of the leading names in the Arts and Crafts movement, such as M.H. Baillie Scott, and Walter Crane. It also contained book reviews and reports on exhibitions of the Arts and Crafts Exhibition Society, the Paris Salon, the Royal Academy, etc.